A beautiful tree, i like it. Are you familiar with my velvet tutorial? 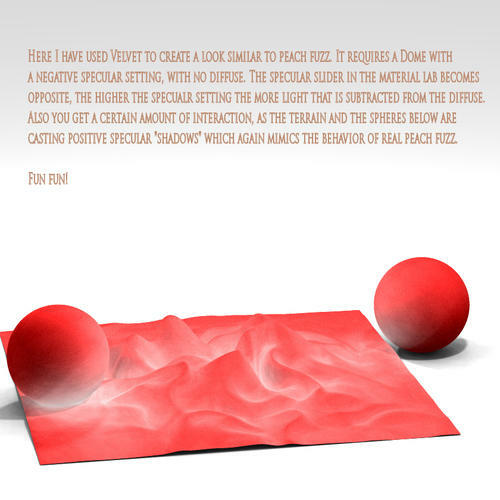 It uses a negative specular dome to create positive specular shadows producing a fuzzy glow. Here is a quick reference render I did showing how the velvet looks when rendered. I will probably chime in later with more feedback on how it is done. I'm afraid peach fuzz (at least the way it's been done in Carrara) may not possible to be done in Bryce atm. You can try to do it in post like I did - by rendering additional channel that's not natively available. It's not grapes, but the translucency part is convincing. Inspired by the jelly (http://www.bryce5.com/details.php?image_id=2351) using higher TIR? I left-clicked on the ZIP and Dwnload links and only get one message: "Hotlinking is not allowed"
Why put in the Download and ZIP links if you dont want to let people to download it? Oh, I found the mistake. The Bryce5 site doesnt handle Firefox well. With FF i get the message that hotlinking isnt allowed while Internet Exploder downloads it just fine. This is what I am talking about. If you are interested let me know and I will explain how it was done. thats quite a neat trick, completely done in Bryce? Yes, completely done in Bryce. There are some sample materials and the like at Sharecg that go with the negative specular dome but I hear there is some oddness with the site over there lately so I dont feel confident in sending people there. I will need to look up the original thread in the archive forum otherwise I'll be forced to rebuild the darned tutorial on this side. Rashad I found the tutorial in the forum archives. Ah, great. But I'm going to upload a quick tutorial here for you that is simpler than reading through that thread. 1. Open a new scene in Bryce 7 Pro. 3. 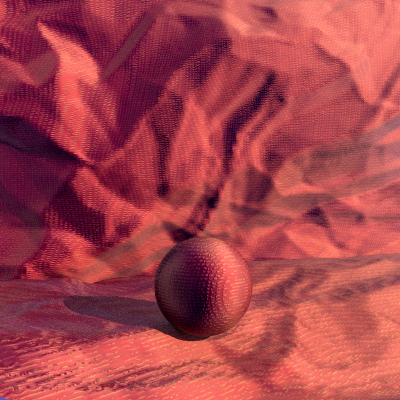 Name the Sphere "Cloth." ALL ITEMS YOU WANT TO RESPOND TO THE NEG SPEC LIGHT NEED TO SHARE THE SAME NAME>>>CLOTH> Enter the Material Lab. 6. 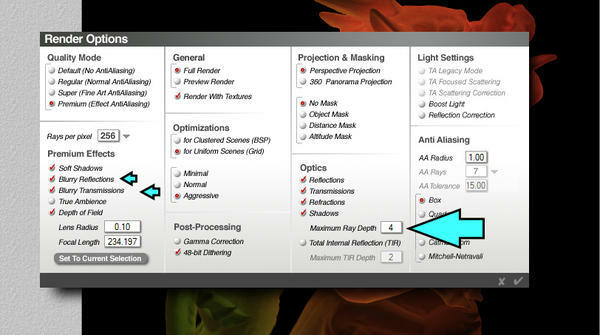 Apply the following settings to the Dome EXACTLY as in the image below. You are now ready to render velvet. But there are a few more considerations. 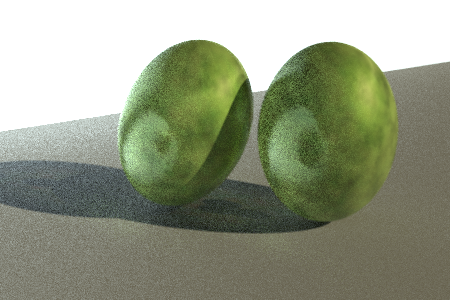 First, you need to make sure you have good lighting generally before you get into the negative specular thing. You need to make sure you have a bright enough sunlight with a diffuse at least 100 and a positive specular intensity roughly double to triple the diffuse intensity. Also, you need some form of indirect light by means of True Ambience or some cluster light form like IBL or another Light Dome and a little positive specular in that dome wont hurt either. 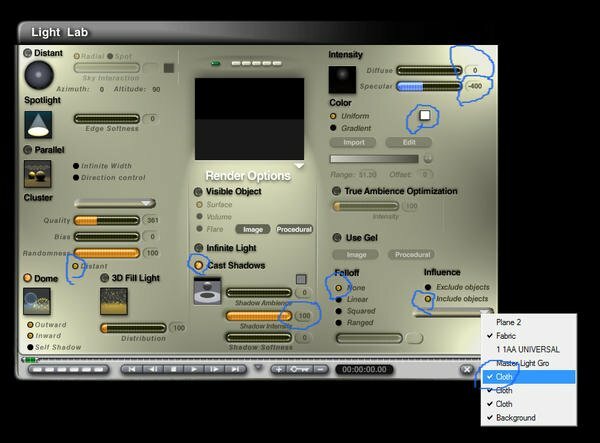 For general indirect lighting my suggestion is to create another Light Dome, make this one normal and remember to enable the Distant option so that the dome enlarges to the size of an IBL probe and can behave similarly in quality and randomness controls. You need to disable shadow casting from the ground plane to allow your fake gi dome IBL or otherwise to shine up from beneath. The upward light bounce is often overlooked in Bryce, but for this effect you need light coming in from all angles. The Negative Specular dome by contrast penetrates all surfaces except those few which are named "Cloth." Important to remember is that two items which are both lit by the Neg Spec dome will cast positive shadows onto one another creating very strong highlights, which is cool but can be too much in some cases. 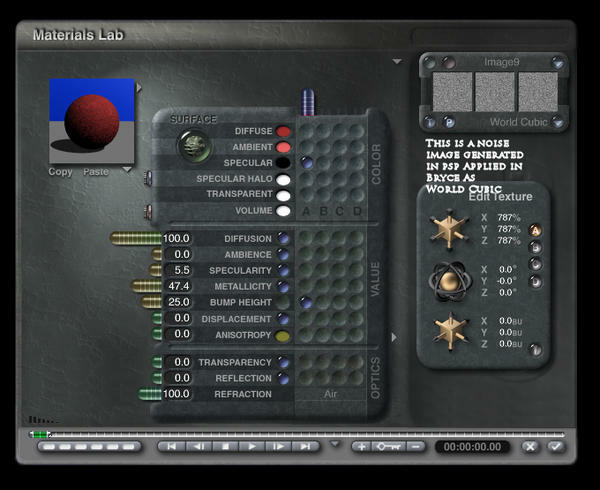 Higher material specular settings result in a darker looking material with ever brighter positive highlights. Increased specular under this neg spec dome behaves almost like a contrast control for the velvet effect. This effect is not yet ideal for TA, and the reason is that it requires the negative specular dome and domes generally dont get along well with TA due to their point like nature. 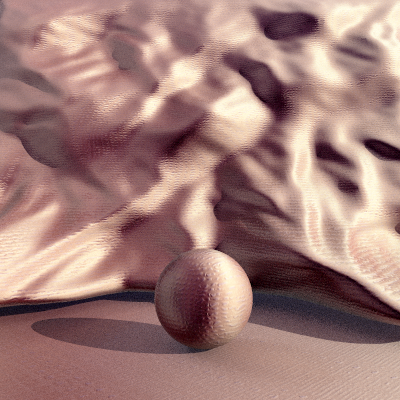 TA can always "feel the presence" of point sources even when they are excluded leading to very slow render times. But in fake Gi situations, this velvet is king! That looks amazing! Did you use TA as well, if so that would be fantastic?! ok Here is the Fruit Plate, I think I need to redo the grapes as purple ones, but thats for another day.. I think this looks great. I agree with Len the fabric came out nicely. 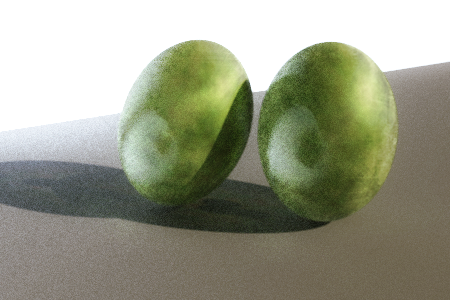 All this fruit plate reminds me of a render I made long ago for a challenge at Renderosity. I too remember having a devil of a time with the fruit. The only one I really got right was the apple skin, the grapes look like plastic as does the rest of the stuff. It was before Bryce 7 so I couldn't do my velvet as peach fuzz trick. 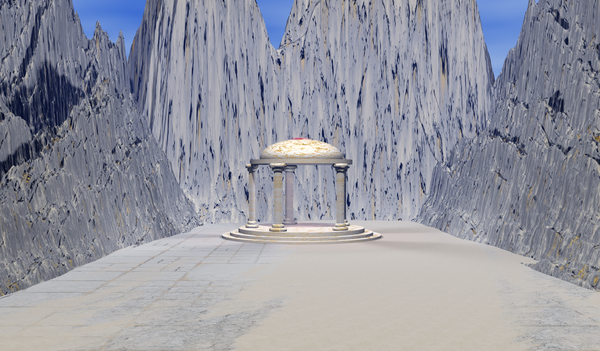 I'm slowing following a tutorial and have made the temple for this particular state. Instead of putting the temple on top of a mountain, I decided to try something different; I also have a mountain idea but it's still in the mind works. It's one of two I've rendered, but will play more with it because I'm not satisfied with the results. Well it looks proper sandy, that's for sure, which tutorial are you following? Wouldn't mine playing with that, perhaps even to combine it somehow with Rashad's velvet! Not been up to much this last week (unless producing mucus counts?) thanks to the inevitable Winter round of germs, but I'm feeling a bit better now - ish... Still not really got much voice left to speak of - which goes without saying? Anyway, I've continued pondering SSS and I had a little idea to test, here instead of absorption through volumetric material, I've used internal reflection to modify the light transiting the interior - because there is a limit to the number of bounces, the ray depth, by bouncing the light around inside it effectively gets absorbed by running out of speed (ray depth) - or so I reckoned. 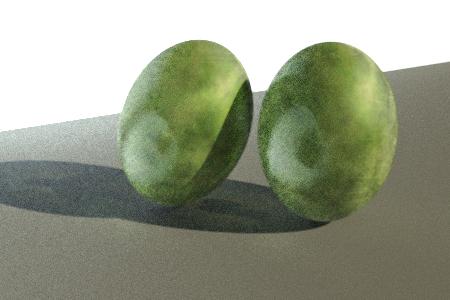 This took one hour forty to render - so not that efficient. I used a green light on the left and a red light on the right. No other light sources. Horo's Heating Room HDRI provides a backdrop just for reflection. Sorry to hear you've been sick but glad to hear you're on the mend in time to enjoy the holidays in reasonably good health. I am using only what you taught me and fiddled a bit around with it. Another fun material I've once made (but that in different renderer) was rubber - the diffuse was upped even slightly above 100% and the specular value (in material) was negative - sth. like -25%. 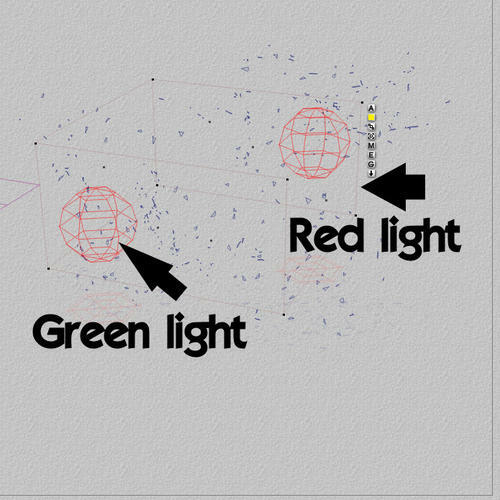 It could be simulated in Bryce by having for each diffuse light source - two specular light sources - positive and negative - exclude 'rubber' from positive ones and include the 'rubber' in the negative ones. ok Velvet Test 1 based on the tutorial.. I made my own noise material, instead of downloading the one from sharecg.. Thanks Mark, yeah well I'm not very good at stomach bugs and colds, I have a low tolerance for such things. 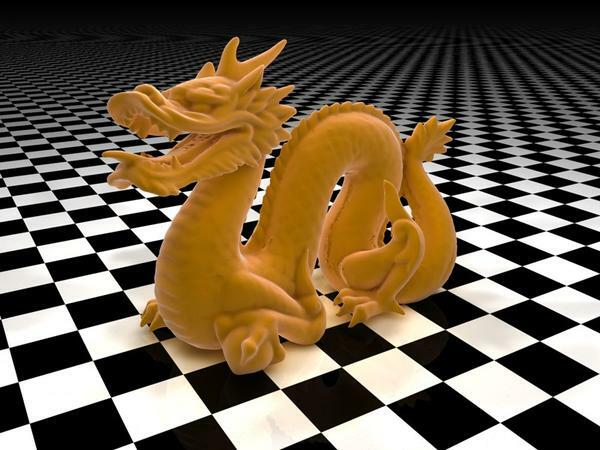 Erieann's peachy dragon really caught my eye, it almost has the electron microscope look about it. I like that effect very much. Of course Rashad's velvet texture method is very clever. I decided I'd have a play and tired turning the idea on its head by swapping the roles of the lights, but the results were not as good as yours (second image). Now Dwsel has moved onto rubber... I can't keep pace! Which is a good thing. 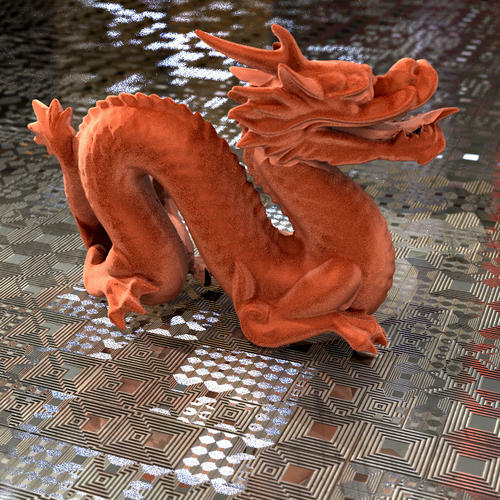 First image, still mucking around trapping light inside the surface of objects in a vague hope to simulate SSS without resorting to difficult to replicate double mesh solutions. 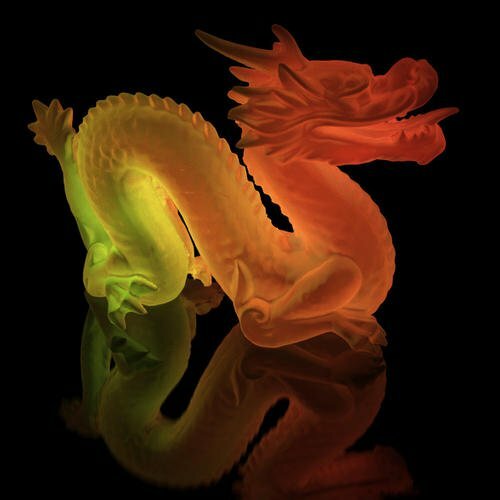 OMG I love the effect on the first dragon, that looks incredible. The settings for this effect are not overly complex. 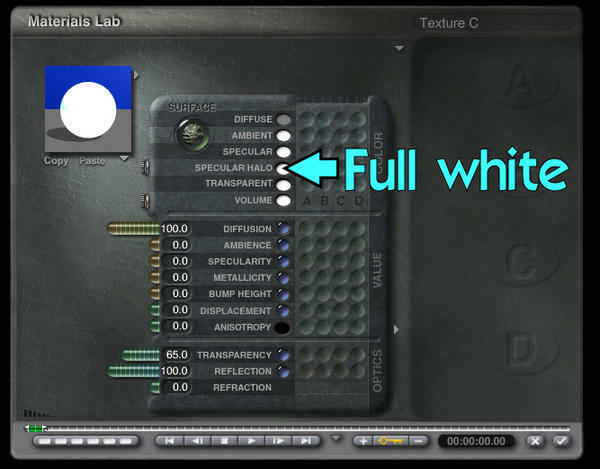 Key is the interaction between the specular halo colour (fully white) and the blurry render options. 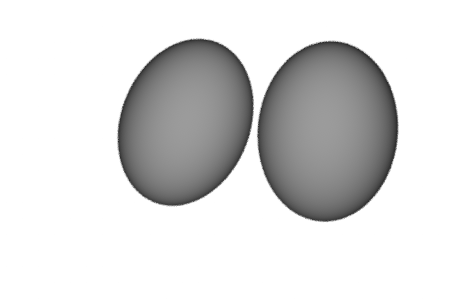 The internal reflections die off after they max ray depth has been exceeded. I think I've got the velvet instructions down. found a good noise bump to use (after much testing) looks pretty good.. Yes that looks like a good material, the effect seems quite sensitive to the bump scale and indeed to the scale the image is reproduced in the forum. @pumeco: The tutorial is by [rul=http://www.robinwood.com/Catalog/Technical/BryceTuts/BrycePages/Bryce1Start.html] Robinwood from the Beginning Bryce 5 course syllabus. I believe the temple tutorial is under Scenes on the left hand side. The sand was not planned, it just happened. One of the flukes I don't think I could reproduce if I tried--since I don't know how it happened in the first place. I'm not real pleased with the lighting, so I do more renders until I'm satisfied. Rareth...excellent work! Would it be asking too much to post the settings (in, say, Bryce screencaps) that you are using - it might be useful for others in the future.